Mix together barley, cream and milk, and bring to a boil. Add hay flower mixture, leave to simmer for 20 minutes and leave to infuse for 30 minutes. Strain hay flower infusion, heat up again and leave to infuse with melilot for 4 minutes. Strain 160 g melilot infusion and homogenise with chocolates. Create chocolate shells with tempered Cacao Barry®dark chocolate couverture Extra-Bitter Guayaquil 64% cocoa. Leave ganache to cool to 32°C and fill chocolate shells. Mix together and heat Fruit'Elite "Seasonal Flavours" Apriconilla Fleur de sel puree Capfruit, Fruit'Purée Calamansi Capfruit and glucose. Add sugar and pectin, and heat up to 90°C. Mix in citric acid, apricot essence and melilot, and leave to infuse for 4 minutes. Strain, leave to cool and pour into chocolate shells. Keep some apriconilla aside for decorating. Make well, and incorporate cream, butter, white wine and Kirsch. Mix into smooth dough. Bake bricelets with traditional bricelet iron and use them for the crunchy chocolate base. Mix bricelet wafer pieces with tempered chocolate and close chocolate shells. Leave to cool, unmould and serve at room temperature. 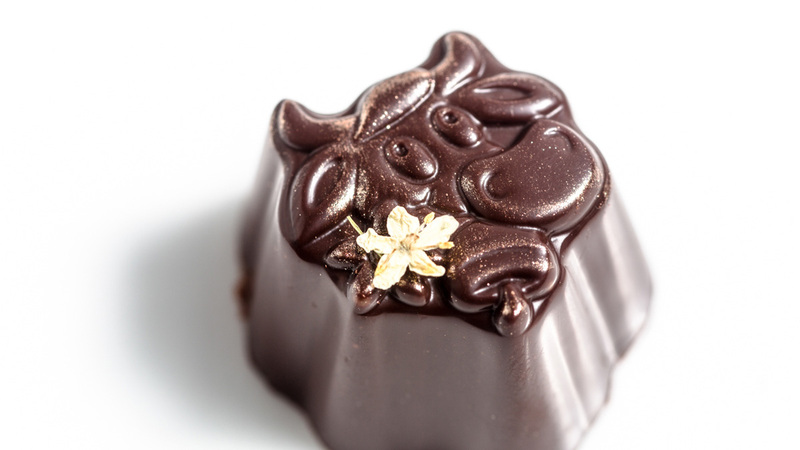 Indulge yourself in delicious Swiss Alpine Kiss pralines.